Fundy Highlands Inn and Chalets - Alma, Hopewell Rocks, Cape Enrage and more! 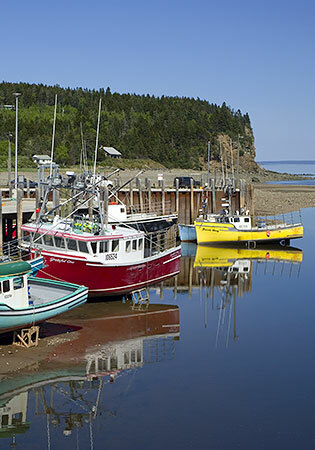 Fundy National Park shares the varied climates of Bay of Fundy and southern New Brunswick. In summer, daytime temperatures vary widely between Alma, which is at sea level, and therefore subjected to cooler water temperatures and the highlands of Fundy National Park, which are often several degrees warmer. While the average summer temperature is 22 C° in the park interior, it may be 6 C° cooler on the same day on the nearby coast. No need for air conditioning, nights are cool and comfortable for sleeping. September and October are favourite months as the maples and birch begin to turn to brilliant fall colours, yet the weather is still pleasant, dry and warm. The Village of Alma is located at the east entry of Fundy National Park and just a few minutes from Fundy Highlands Chalets. Consult our map of Alma. Lobster pounds with fresh lobster and seafood. Liquor outlet, and two general stores. The Fisherman's Wharf in Alma is a favourite place to watch the rise and fall of the Fundy tides. It's just a short drive to the Hopewell Rocks, the wild and awesome Cape Enrage Lighthouse and the August shorebird migration at Mary's Point Bird Sanctuary. The nearby communities of Riverside-Albert, Hopewell Cape, and Hillsborough have a diverse selection of crafts people and artisans, museums, historic homes and a heritage railway. Discover the rich and exciting history that has shaped these small, but friendly communities. Within an hour in each direction, visitors can find full service centres for shopping and groceries. The scenic dairy town of Sussex lies to the west of Fundy National Park, and the large tri-community of Moncton, Riverview and Dieppe lies to the east.